Successfully Added 6 Inch HD Touchscreen Handheld GPS Navigator to your Shopping Cart. 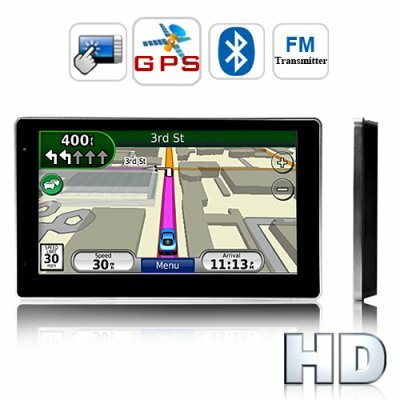 The perfect balance of price and performance, this 6 Inch high definition (800 x 480 screen resolution) touchscreen handheld GPS navigator comes with all the features you need like FM transmitter, Bluetooth, and multimedia awesomeness, making it the perfect GPS handheld device or in car navigation and entertainment solution for your needs. Here's more - it runs today's hottest GPS maps, has 2GB built-in memory and also comes with a free 4GB microSDHC card! This genius of GPS gadgetry utilizes the WIN CE 6.0 operating system ensuring that it runs today's hottest GPS maps and provides access to state of the art GPS features like: Lane Assist, Voice Guidance, 3-D Views, Intelligent Route Planning, and Points Of Interest (POI). Never get lost again and open yourself up to a whole new world of adventure and urban exploration. The TR04 isn't just an incredible GPS device - it's also an outstanding car DVD player alternative. Are you crazy?!! THIS replace my car DVD player??!! Sure why not. Think about it. The TR04 has GPS functionality PLUS it plays all the most popular multimedia files AND it outputs all that entertainment goodness to its super vivid high definition 800 x 480 resolution screen! But wait, there's even more - this six inch wonder has both Bluetooth and a FM Transmitter. Bluetooth lets you pair your cellphone to this GPS navigation device. The FM transmitter outputs audio from this GPS navigator to your car speakers! Imagine this: You're in the car; a call comes through. A quick tap on the TR04's responsive touchscreen and you're talking with your supermodel girlfriend with both hands on the wheel. Whatever you say is picked up by the powerful and sensitive built-in microphone. Whatever your supermodel girlfriend says gets broadcast through your car speakers. "Hurry back, I miss you!" she says. Car DVD player alternative anyone? Whether handheld or mounted in-car (yes this amazing device comes with a free car kit), the TR04 is the perfect device for endless entertainment and never getting lost again. Brought to you by the leaders in online wholesale electronics - Chinavasion! Plays more than a dozen video formats! - External Memory (TF / microSD card support): Free 4GB TF/microSD card included - supports up to 8GB TF / microSD cards! 800 x 480 screen resolution for movies and tv shows that come out clearer, crisper, and brighter! For the best and most accurate GPS reception, make sure you are in open sky. Open sky is a GPS term which means that your GPS device should be able to see at least 7 GPS satellites. With its AV IN jack, you can easily output a DVD player or game system to this GPS device. Better yet, connect your rearview camera to the AV IN jack. Once the AV cables are in, the screen automatically displays the video image. No buttons to press! Viable car DVD player alternative in that it has GPS, multimedia functionality, FM transmitter and Bluetooth. Car mounting kit included free. Toggle ON/OFF/Gentle touchscreen click sound. You don't have to pay to use GPS. The satellites which transmit GPS coordinates are maintained by the US government. You just need a GPS receiver to take advantage of the data. The CVMF-TR04 contains a top of the line GPS receiver. Where can I download free GPS software and maps? Use your favorite bit torrent search engine to find GPS software and maps. Or use google. Try "[insert name of GPS software manufacturer here], rapidshare, megaupload". Copy the software and maps onto a microSD card. Insert it into the microSD card slot. From the main menu go to SETTINGS. Then select NAV SETTINGS and browse your microSD card. Look for a file that looks like this: nameofGPSsoftwaremaker.exe where the first part of the file before the dot is the name of the software maker, and the part after the dot signifies that it is an executable file. Once chosen, back out and launch GPS. How do I pair my phone to this GPS navigator? Easy. From the main menu, click on the Bluetooth icon. Put your cellphone into Bluetooth mode so it can be discovered by this GPS device. on 2011-04-18 23:14:12 Very nice gps! works perfect. Nice screen for looking on film! Using it with IGO8. Nice with bluetooth for the mobile phone, and the FM transmitter to get the filmsound in the carspeakers. Fast delivery to Sweden. I can reccomend this GPS for every one! EXCELLENT PRODUCT,THE PRICE IS PERFECT,WORKS FINE. Very good communication with Chinavasion. I received him in 10 days with EMS. Very good and practice the screen . Function very well, very good. Very good market for his price.